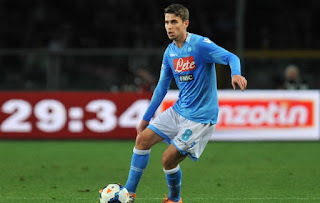 Arsenal target Napoli star Jorginho Premier League side Arsenal are preparing to sign Napoli midfielder Jorginho, according to the latest reports in Italy. Premier League side Arsenal are preparing to sign Napoli midfielder Jorginho, according to the latest reports in Italy. The reports revealed that the North London outfit are planning to offer for the Brazilian midfielder in the winter transfer window which will open next year. The Serie A side are in no mood to sell their star midfielder for less than £22million. Arsenal manager Arsene Wenger will have to splash atleast £20million. Jorginho has made more than 40 appearances for the Serie A side since signing the deal last year. The reports further revealed that Arsenal sent scouts to watch Jorginho in the last league game against Genoa on Sunday. The Gunners have several players on the sidelines including trio midfielders Aaron Ramsey, Jack Wilshere, Alex Oxlade-Chamberlain and striker Danny Welbeck. Arsene Wenger is keen to bolster his squad in the winter window as he is eyeing for the Premier League title. Arsenal are currently on the second spot in the Premier League. Manchester City leading the table with the help of goal difference. Jorginho was signed by Napoli from Hellas Verona back in January in 2014. The midfielder who has been a regular player is eyeing for a move to England in the coming transfer window.